SKU: Model PCS. Category: Control Systems. The Pendulum Control System, PCS2, is designed for the study of control engineering and theory. The PCS2 consists of a carriage module and analogue control module with a mimic of the system. It can function as a stand-alone analogue system or be interfaced to an external controller such as a PC using a suitable interface card. The PCS2 is supplied with an interface card and PCSDS software. The software includes attempted Linear control, attempted Harmonic control, and Direct Digital Control and Fuzzy Logic control. Students can compare the performance of the different controllers. Connection is through 4mm-shrouded colour coded sockets and to an interface card through the IDC connection. 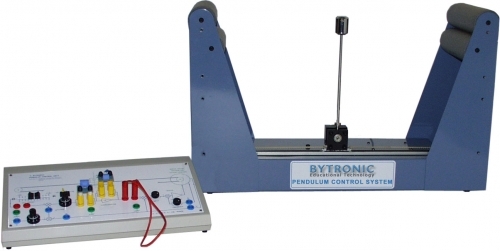 The PCS2 can be used in two different modes, an inverted pendulum or an overhead crane, each mode presents a control situation that requires a separate approach and solution and an understanding of how feedback systems function. The first mode; control of an inherently unstable system, to balance the pendulum in the inverted position the pivot must be continuously moved to correct the falling pendulum. In the second mode; the carriage module is turned upside down to act as a crane, the pendulum swings into an equilibrium position with the centre of mass below the pivot, control the Linear position of the load, with very oscillatory dynamics.